The holidays are right around the corner. So why not draw your own Polar Bear? Once you’re finished sign your name and give it to a friend or family member. This project is courtesy of Art Projects for Kids. Step #1 – Draw the bear according to the tutorial. Step #4 – Draw small circles with blue paint in the background. Fill the blue area in around the circles. Send us a picture of your finished polar bear. We’d love to show him off on Show Us Your Stuff Saturday. Click here for more details. Want to learn more about the polar bear? Check out this fun fact-filled article. 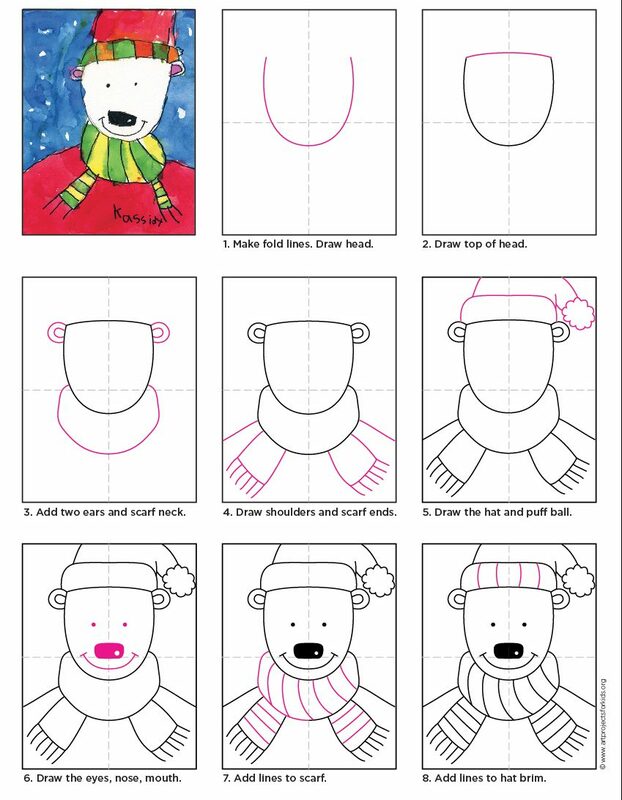 My kids are totally in love with your step-by-step drawing projects. The instructions are so easy to follow. My 5 1/2 year old daughter turned her polar bear drawing into a greeting card. She enjoyed picking out her own colors and adding more details to make her polar bear look so special. Great! We love encouraging kids to draw. Please feel free to share any artwork with us for Show Us Your Stuff Saturday!